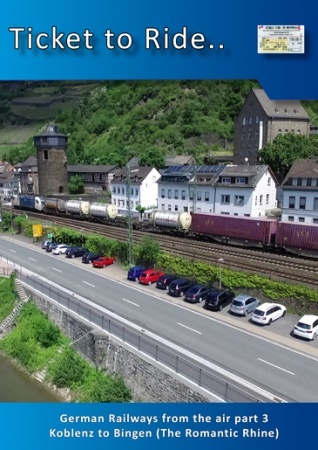 TTR234 German Railways from the air part 3 Koblenz to Bingen. Enjoy wonderful Rhineland scenery with us as we follow the mighty river south from Koblenz to Bingen. This is the ‘Romantic’ section of the Rhine. The river is at its narrowest and the towns and villages along the route hug the railway tightly and the vineyards tumble down almost to the water’s edge. Our journey includes all the ‘must see’ locations: Boppard, St Goar and Goarshausen, the Loreley, Oberwesel, Kaub (with its Ship of Stone Castle in the middle of the Rhine), Lorch, Bacharach, Aßmannshausen and complete our journey at Bingen where the Rhine is joined by the Nahe. Filmed in glorious spring weather with lots of rail action-and boats of all types- you will see the Rhine as you have never seen it before.